Surprisingly, this story echoed my own fear of water, which I’ve harbored ever since I can remember. I have been plagued with nightmares about water in all forms. The main character, Kyna, has suffered from an almost-paralyzing dread of water since she was three. She was the sole survivor of a storm at sea that her family was involved in. Adopted by the couple that rescued her, she slowly learns not only how to cope with water, but bits and pieces of her adopted family’s history. It isn’t without a struggle, for her Mem and Pep, Ronan and Itha, are pretty silent when it comes to their history. All Kyna knows is that her adopted family are Irish, bilingual, and love to swim as much as possible. To pay the bills, Pep is a writer, and Mem is an illustrator. Kyna is frustrated by their refusal to share their history. They use fabricated (so she argues) Irish folklore stories to distract her so much that she has every fairy and leprechaun yarn memorized word for word. Despite the intense secrecy and Kyna’s fear of water, she’s a strong 10-year-old girl who actively pursues her own interests, like photography. When the family moves to an island home for the summer, she takes up with a local boy, Tylo, and explores the land, searching for the perfect shot. Tylo is fun to hang with-except for the fact that he really believes that selkies exist—humans who can transform into seals—and that he’s seen a pod of them in the lake. It’s up to Kyna to decide whether she will follow him there, to convince him that selkies aren’t real. The clues to the answer are always in front of Kyna, waiting for her to accept them. The answer itself helps Kyna to confront her watery fear once and for all. The ending provides a nice surprise. 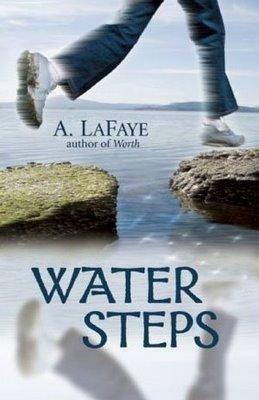 A quick read, Water Steps is a great addition to any pre-teen library.